Irish players congratulate Sean Cronin after his try against Scotland. Ireland will arrive in Australia in June as Six Nations champions after defeating Scotland in Dublin on Saturday. England's loss to France in Paris means that Ireland have won the 2018 title with a game to spare. They also have the opportunity to claim a rare Grand Slam if they can defeat England on St Patrick's Day in Twickenham. 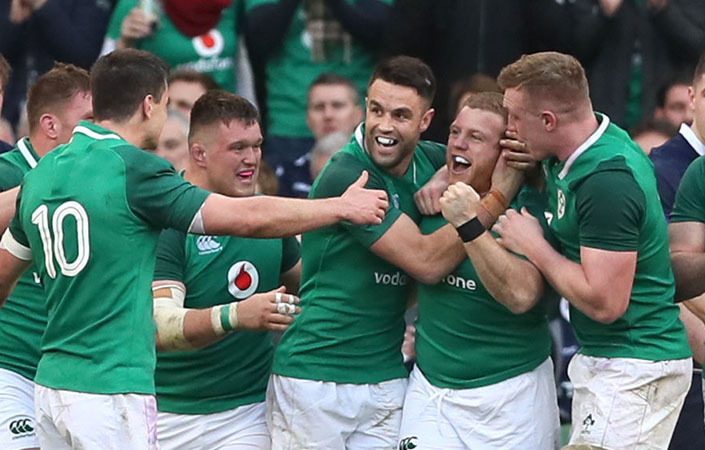 Ireland racked up a 28-8 bonus-point win over Scotland in Dublin to move within just one victory of their first Six Nations clean sweep since 2009. Head coach Schmidt's side must end England's unbeaten Twickenham record under boss Eddie Jones, who took the helm in December 2015. Ireland are unbeaten at home in the Six Nations since 2013, leading Schmidt to insist he knows full well the pressure England face defending home-turf honour. 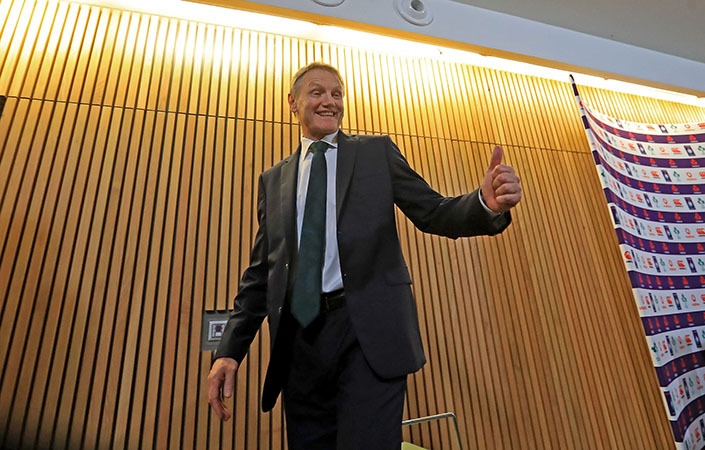 Ireland head coach Joe Schmidt after the win over Scotland. "I guess history doesn't protect you from the future; we knew that today," said Schmidt. "We hadn't lost in five years in the Six Nations here in Dublin. It didn't protect us, we had to go out and win again today. That's all part of the challenge. "We need to go to Twickenham and try to test that record out, I guess. "But it won't be uppermost in our thinking because you can be distracted looking back when you need to be moving forward. "We didn't feel our five-year run in the Six Nations here protected us. "And I'm sure Eddie Jones and the boys will be fully focused on winning the game next week." Jacob Stockdale became the first Irishman to claim six tries in a single Five or Six Nations competition with a brace against the Scots. Conor Murray and Sean Cronin sealed Ireland's third bonus-point win in their four clashes to date, with the Grand Slam now on the line at Twickenham. 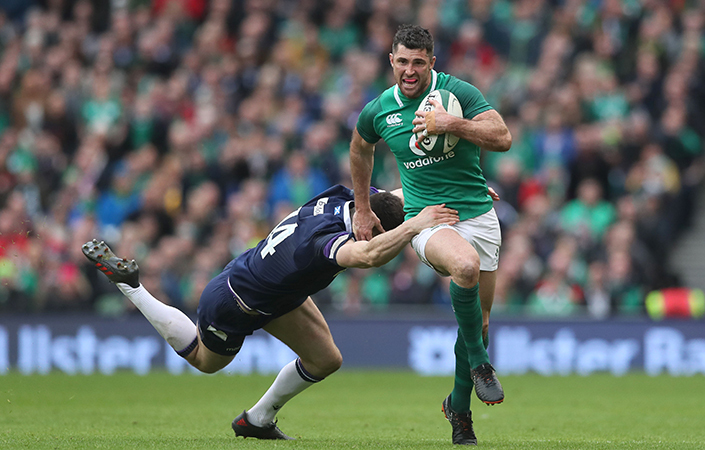 Man-of-the-match Rob Kearney on the burst against Scotland. Ireland registered a national record 11th consecutive win too, in another boost for former Leinster boss Schmidt's hugely impressive tenure. Asked how he would feel to guide Ireland to a Grand Slam to equal the exploits of the 1948 and 2009 vintage, Schmidt said: "I think it would give me incredible satisfaction. "I work with these young men who go out and do an incredibly difficult job and work very hard. It would give me incredible satisfaction to see that rewarded. "In the end the satisfaction is something that really is placed around the effort that they make." Only Best and Rob Kearney remain in Ireland's squad from those that claimed the Grand Slam in 2009. Current skipper Best admitted Ireland will now need to summon their best rugby yet in this year's tournament to topple England and complete the clean sweep. "We're going to have to save the best for last, and that's what it's going to take to win everything next week," said Best. "It's only a big game now because of what we've done previously. So we have to stick to those processes. "It would be special for every member of the squad. It is a squad thing. "There will be moments next week when we need to dig deep, and we've a lot of big leaders in that squad. "At times when we were under pressure today and they were trying to play chaotic rugby, we were able to get a breath back and get control through the spine of our team. "Everyone knows the size of the challenge. They haven't lost at Twickenham under Eddie Jones. "It is about as much as possible trying to treat it like another game. We know what works for us." Scotland captain John Barclay admitted his side botched a hatful of scoring chances, which proved definitive on the day. "I don't want to say you get what you deserve in rugby; the scoreline didn't reflect the chances in the game," said Barclay. "But they took all their chances whereas we probably had four two-on-one chances and we took none of them. That's the difference today."